Metastasis of a tumour to the mandibular condyle is rare. We describe a case in which a patient presented with isolated condylar metastasis mimicking acute internal derangement of the temporomandibular joint (TMJ). Open biopsy revealed a lesion seated within the condylar head and extending through the bony cortex to the infratemporal fossa. 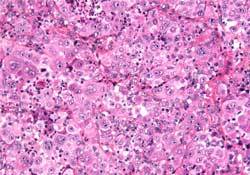 Histopathology confirmed the diagnosis of metastatic large-cell lung carcinoma. TMJ dysfunction may be associated with any pathologic entity involving the mandibular condyle. 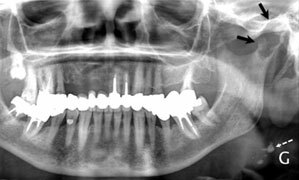 A panoramic radiograph should be considered in patients who do not respond to conventional therapy or whose clinical symptoms worsen. Particular attention must be paid to osteolytic jaw lesions, which can be the “tip of the iceberg” indicating widespread metastatic disease. First described in 19471, metastatis in the mandibular condyle is rare, and only 23 cases have been reported in the literature.2 Approximately half of these cases presented with symptoms related to the temporomandibular ?joint (TMJ); the primary tumour was revealed in only a few cases. Temporomandibular disorders (TMDs) are common and account for the pain and dysfunction of millions of patients worldwide.3,4 Classically, they comprise 2 main pathologic categories: joint and muscular problems. TMJ problems include several diagnostic subcategories, such as congenital and developmental disorders, traumatic injuries, ankylosis, arthritis, neoplasia and internal derangements. Problems involving the masticatory muscles include myositis, myofascial pain, myospasm, hyperkinesia, hypokinesia, contracture and fibromyalgia. Internal derangement and myofascial pain, isolated or combined, are by far the most common TMDs currently encountered. In this article, we describe the unusual case of a patient with large-cell lung carcinoma with isolated condylar metastasis mimicking acute TMJ anterior disk displacement. In January 2010, a 72-year-old woman was referred for investigation of increasing pain in her left TMJ, limited ability to open her mouth and the sense of a malocclusion of 3 months duration. The patient was afebrile and otherwise in good health; extra- and intraoral examinations were unremarkable. The function of the TMJ was evaluated bilaterally to calculate the dysfunction index (Di) described by Helkimo.5 The right TMJ was asymptomatic (Di-0), but the left TMJ showed signs of severe dysfunction (Di-III), tenderness on palpation of the joint, pain during mouth opening and limited mobility of the condyle. Mouth opening was limited to 25?mm and deviated slightly to the left side. There were no spasms in the muscles of mastication and no joint sounds. Protrusive movement was limited to 1?mm; lateral movement on the right side was limited (2?mm), but not on the left (9?mm). Intraoral examination revealed a normal class I molar relationship. The clinical diagnosis was TMJ anterior disk displacement without reduction. Panoramic radiography showed a relatively well circumscribed round to oval radiolucency within the left condylar head (Fig.?1). Computed tomography (CT) and magnetic resonance imaging (MRI) revealed a large mass within the left condyle, eroding the bone medially and infiltrating the adjacent structures as far as the pterygoid process (Figs.?2–4). Figure 1: Panoramic radiograph showing a well circumscribed round to oval radiolucency within the left condylar head (black arrows). Note cervical calcified lymph nodes (white dashed arrows). Figure 2: Coronal computed tomography (CT) scan showing an osteolytic lesion within the left condylar head; destruction of the inner bony cortex is indicated by the white arrow. Figure 3: Axial T2-weighted MRI images showing a large mass (solid white arrow) causing a hypointense signal consistent with a hypercellular tumour. 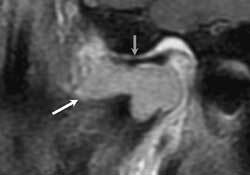 Note the hyperintense signal within the medial pterygoid muscle characteristic of a perilesional edema (dashed white arrow). 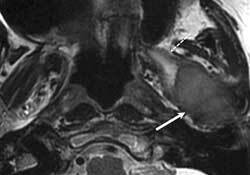 Figure 4: Sagittal T1-weighted, fat saturated MRI images showing a polylobular mass (white arrow) enhanced after intravenous gadolinium administration extending to the temporomandibular joint and repressing the disk (grey arrow). The same month, an open biopsy using a pre-auricular approach was performed under general anesthesia. Microscopic examination of the specimen showed proliferation of a malignant epithelial tumour consisting of round to polygonal cells with large nuclei, prominent nucleoli, abundant cytoplasm and generally rather well defined cell borders, without squamous or glandular differentiation (Fig.?5). Inflammatory cells were present in some areas. Immunohistochemically, the cells expressed cytokeratin (CK) 7 and were negative for CK20, thyroid transcription factor-1, the neuroectodermal antigen S100, human melanoma black-45 and breast-2. The proliferation index for antibody ki67 was about 50%. These findings were consistent with a metastatic large-cell lung carcinoma. 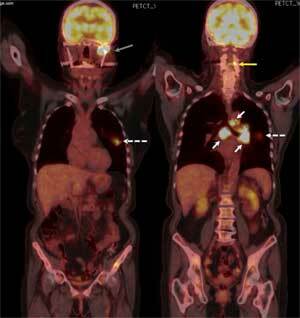 Positron emission tomography (PET)/CT revealed the primary tumour within the left pulmonary lingula along with hilar and subcarenal nodes with increased metabolic activity as well as multiple vertebral lesions (Fig.?6). Figure 5: Tumour composed of atypical polyhedral large cells with abundant eosinophilic cytoplasm, some of them containing large nuclei and prominent nucleoli (hematoxylin and eosin, ×20). Figure 6: Positron emission tomography/computed tomography revealed the primary tumour within the left pulmonary lingula (dashed white arrow), hilar and subcarenal nodes (solid white arrows), a thoracic vertebral metastasis (yellow arrow) and the condylar metastasis (grey arrow). Note: Above images are 2 frontal views made at 2 different levels. The patient received condylar, vertebral and pulmonary palliative radiotherapy associated with 2 cycles of gemcitabine-vinorelbine. She died 6 months after the initial hospital admission. According to the World Health Organization, large-cell carcinomas account for only 9% of all lung carcinomas and are typically located in the lung periphery.6 On gross examination, they frequently appear as large, necrotic tumours. Histologically, the tumours usually consist of sheets and nests of large polygonal cells with vesicular nuclei and prominent nucleoli. These tumours have a particular propensity to metastasize early by a hematogenous route to the liver, adrenal glands and brain; they rarely spread to bone. Thus, our case was remarkable and unique: a large-cell lung carcinoma metastasizing to the condyle where it mimicked a “benign” TMJ internal derangement (anterior disk displacement without reduction), as the first clinical manifestation. Oral metastatic tumours are uncommon, accounting for approximately 1% of all malignant oral neoplasms, and they represent the first sign of metastatic disease in almost 25% of cases.7 Most lesions are observed in jaws, especially in the molar area of the mandible, with the lung and the breast as the most common primary sites. Condylar metastases from lung carcinoma are exceedingly rare.2 Clinically, condylar metastases potentially mimic TMJ-related symptoms, especially TMJ arthritis, with the patient complaining of severe TMJ pain, swelling and trismus. Neoplastic neuropathy involving either the mandibular division of the trigeminal nerve or the branches of the facial nerve has also been described. 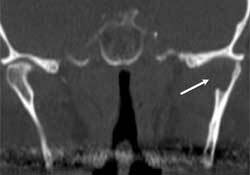 Radiographically, condylar metastases lack pathognomonic characteristics. They usually present as well- or ill-defined radiolucencies on conventional radiographs. MRI and CT can differentiate between solid tumours and cysts. MRI imaging allows for an accurate evaluation of the relation between the masticatory spaces and the TMJ, as well as the surrounding structures, such as the parotid gland, skull base and parapharyngeal space.8,9 Moreover, MRI can also provide information about the aggressiveness of the tumour, as the signal from the tumour on a T2-weighted sequence reflects the degree of cellularity. Tumours with a hyperintense signal on T2 cells are less cellular than tumours with a low signal. A PET scan is usually indicated when the biopsy result is consistent with that of a metastatic tumour.8 Combining both morphologic and functional metabolic information, PET/CT allows for a more precise evaluation of the extent of the tumour. In our case, the PET/CT scan allowed us to identify the association of a large previously unknown pulmonary mass with multiple bone metastases, thus resulting in the diagnosis of a stage IV metastatic lung tumour. Two important considerations regarding mandibular metastases must be emphasized. First, their radiologic appearance can be misdiagnosed as a benign lesion (e.g., odontogenic cyst, aneurysmal cyst, simple bone cyst, hemangioma, Langerhans cell histiocytosis). This can delay prompt diagnosis and further treatment, even though the jaw metastases usually indicate widespread disease and treatment is often palliative. Second, they can represent the first manifestation of an undiagnosed tumour and, for this reason, a biopsy is mandatory to obtain a correct diagnosis rapidly. In conclusion, dental practitioners should be mindful that several pathologic entities, such as tumours, infections and inflammations, can mimic benign TMJ dysfunction. A panoramic radiograph could be considered as the first-line radiologic examination among patients who do not respond to conventional therapy or whose clinical symptoms worsen. Moreover, particular attention must be paid to osteolytic jaw lesions, which can represent the “tip of the iceberg” indicating widespread metastatic disease. Dr. Scolozzi is head, division of oral and maxillofacial surgery, department of surgery, H?pitaux Universitaires de Genève, Geneva, Switzerland. Dr. Becker is associate professor, division of radiology, H?pitaux Universitaires de Genève, Geneva, Switzerland. Acknowledgement: We thank Dr. Beno?t Imholz for his help in the preparation of the manuscript. The authors have no declared financial interests in any company manufacturing the types of products mentioned in this article. Thoma KH, Holland DJ Jr, Rounds CE. Tumors of the mandibular condyle; report of two cases. Am J Orthod. 1947;33(5):344-50. Kaufmann MG, Perren A, Gr?tz KW, Eyrich GK. Condylar metastasis. Review of the literature and report of a case. Mund Kiefer Gesichtschir. 2005;9(5):336-40. Scrivani SJ, Keith DA, Kaban LB. Temporomandibular disorders. N?Engl J Med. 2008;359(25):2693-705. Stegenga B. Nomenclature and classification of temporomandibular joint disorders. J?Oral Rehabil. 2010;37(10):760-5. Helkimo M. Studies on function and dysfunction of the masticatory system. II. Index for anamnestic and clinical dysfunction and occlusal state. Sven Tandlak Tidskr. 1974;67(2):101-21. Brambilla E, Travis WD, Colby TV, Corrin B, Shimosato Y. Eur Respir J. 2001;18(6):1059-68. Hirshberg A, Shnaiderman-Shapiro A, Kaplan I, Berger R. Metastatic tumours to the oral cavity — pathogenesis and analysis of 673 cases. Oral Oncol. 2008;44(8):743-52. Epub 2007 Dec 3. Shintaku WH, Venturin JS, Yepes JF. Application of advanced imaging modalities for the diagnosis of metastatic adenocarcinoma of the lungs in the temporomandibular joint. Oral Surg Oral Med Oral Pathol Oral Radiol Endod. 2009;107(6):e37-41. Freudenberg LS, Rosenbaum SJ, Beyer T, Bockisch A, Antoch G. PET versus PET/CT dual-modality imaging in evaluation of lung cancer. Thorac Surg Clin. 2010;20(1):25-30.